This colloquy will gather 15 deans for two week-long sessions – one in June 2011 and the second in March 2012. It will explore the vocation of a theological dean as an academic leader and the role of the dean as a change agent in the fast changing contours of theological education in the early years of the 21st century. Theological deans are called to be leaders, educators, teachers, administrators, scholars, mentors, church leaders, and managers. Balancing this complex web of roles and tasks requires time for reflection, planning, and self-care, which this colloquy hopes to provide in a collegial and confidential atmosphere among peers. What are the most pressing issues facing theological education in the next 5 to 10 years? What are the leadership styles and best practices that would enable a theological dean to navigate the realities of the religious landscape? How will theological deans help faculty and institutions engage the competing expectations from the academy, church, and society? How will theological deans address the pressure to provide accessible, short-term preparation, and alternative degrees while meeting the needs of students with divergent backgrounds and ministerial paths in relation to an ongoing commitment to academic integrity and quality preparation in the 21st century? How do deans creatively engage institutional responsibilities such as assessment, accreditation, and curriculum development as a means toward responding to the pressures and challenges of theological education in a changing world? How does the dean serve as leader of and advocate for the faculty in the context of shared governance structures that include the president and board of trustees? How does one find, recover, inspire, and retain joy in the strife of deaning? Front Row (left to right): Lynn Jost (Fresno Pacific Biblical Seminary), Jack Holland (Emmanuel Christian Seminary), Randy Litchfield (Methodist Theological School in Ohio), Arch Wong (Ambrose University College Seminary), and Albert Hernandez (Iliff School of Theology). 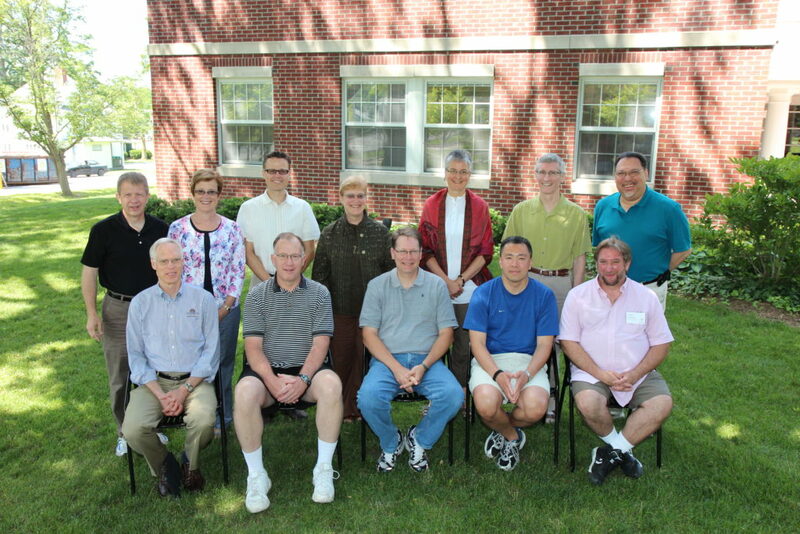 Second Row: *Paul Myhre (Wabash Center), Leanne Van Dyk (Western Theological Seminary), Robert Alvis (Saint Meinrad School of Theology), Elizabeth Liebert (San Francisco Theological Seminary), *Melanie Duguid-May (Colgate Rochester Crozer Divinity School), *William Cahoy (St. John’s School of Theology Seminary), and *Efrain Agosto (Hartford Seminary).